Playing tennis involves fast rigorous movements due to sprints, jumps, backward motions and split steps. Tennis is a highly demanding game! Therefore, tennis players need more than just talent and practice, in order to get to their best performance. Great tennis players require shoes that increase their agility and endurance and support their swift movements. Some tennis players make the mistake of buying normal running shoes for playing tennis. However, running shoes are not ideal for tennis players, since they are designed to produce quick forward motion. Running shoes have flexible and soft soles, designed to absorb running impact. They are not made for side stepping at all. So it is always advisable to buy an actual tennis shoe, if you want to play tennis. Tennis shoes are crafted with extra additional lateral support, meant to accommodate forward motions as well as side-to-side stepping action. They are also designed with tougher materials to support the ankles and feet during sudden start or stop movements. The tennis shoes you wear, determine your comfort on the court and, also not unimportant, how long you are able to last. Additionally, they can also determine your level of play or performance. If you buy the wrong type of shoe, then you are exposing yourself to injuries more than necessary. You are also lowering your performance on the court. Therefore, wearing tennis shoe when playing tennis is an important part of a good, enjoyable game. Why Are Quality Tennis Shoes So Expensive? Tennis is a professional sport, played by thousands if not millions of people in the world. It is also a technical sport, that requires more than just technical skills. With that in mind, the tennis shoe is a very important part of the modern game. It affects how an individual performs on the court. Therefore, manufacturers of tennis shoes have realized the need for high quality shoes that encompass all the demands of the game. The shoe has to be designed with various aspects in mind, so that it can help you make the very best of your tennis game. High quality shoes are priced high, because manufacturers invest plenty of time and effort in their production. The costs of the investment needs to be recouped. Hence the price tag. But if you are starting out with tennis, then you can go for an entry level tennis shoe. Where to Buy Top Tennis Shoes for Men Online? From pros to beginners, choosing the shoe that fits your individual style and play, is something you need to spend time researching. Many players go for shoes that either cost the least or look great aesthetically. You can find the right balance between those two aspects, if you take your time. You also need a tennis shoe that will ensure that you avoid injuries, while playing at optimal levels. If you are a professional player and your main issue is cutting costs and buying a cheap tennis shoe, then you might end up with injuries, thereby incurring unplanned hospital bills, going on ten times or more than what you would have spent on a quality tennis shoe. It would really be better if you just invest in a high quality shoe that lasts you a long time. It’s an investment. There are plenty of very popular brands. These are Nike, Adidas and Asics, among others. And the good news is that these brands have a pretty strong online presence, so you can shop for them without ever having to leave your chair. You can find them on Amazon, eBay, TennisExpress, etc. Which Tennis Shoes For Men Have The Best Arch Support For Flat Feet? Whether you are a beginner looking for a great pair, or an accomplished player looking to replace your worn out pair, it is important to find the right type of shoes for your personal needs. Tennis players with flat feet need a stable shoe that can support their low arches. More often than not, flat-footed people tend to be overpronators. This implies that playing in a shoe with too high an arch can lead to injury, discomfort and lead to costly operations. You can (almost) always put your own insoles into your shoes to customize the support as you see fit. But it still helps to go for shoes that are designed with flat footed people in mind. Some good shoes for flat feet include the Asics Gel Resolution 5, Nike Air Max Cage, K-Swiss Bigshot II, Head Prestige Pro II, etc. Which Tennis Shoes For Men Are Best For For High Arches? Tennis is a sport that involves a lot of agility, speed and movement. This implies that the player will have frequent impacts with the surface they are playing on. If you have high arches, you will understand the pain and discomfort you can sometimes feel in your heels and in the balls of your feet, when walking. Let alone playing an intensive game like tennis. However, with the right tennis shoe, you can enjoy your game a little more, without having to be dragged down by unnecessary pain. Tennis shoes for either low or high arches, simply need to offer the support you, personally, require. It is possible that people with both low and high arches prefer the same amount of arch support in a shoe. It’s not exactly one-size-fits-all. It’s not an exact science, either. By combining durable materials and designs, together with shock absorbing cushioning. This can really help in preventing you from painful feet problems in the first place. Some good cushioning and shock absorbing shoes include Adidas Barricade 5, K-Swiss Grancourt II and New Balance WC1005. Which Tennis Shoes for Men Have The Most Cushioning? Tennis courts come with different surfaces. There are those surfaces featuring clay, grass or hard surfaces. If you are playing on hard surfaces, then you require a shoe with good comfort and cushioning. Some of the best tennis shoes with most cushioning include Reebok shoes designed with DMX technology, Adidas BII, Adidas Barricade, Nike Air Implosions, Adidas A3, and so on. You can also use your own cushy orthotics for more cushioning. Which Tennis Shoes For Men Are Best For Plantar Fasciitis? It is a common occurrence for those who participate in energetic sports and games, to suffer from plantar fasciitis during the course of their career. Tennis players are at a higher risk of developing plantar fasciitis due to certain biomechanical issues caused by wearing shoes with insufficient arch support, lack of stretching, or playing on uneven surfaces. Considering these things, it is important to choose the right men’s tennis shoes that will prevent plantar fasciitis from ever happening in the first place. This will keep the pain away and allow you to produce an energetic performance on the court. Some of the tennis shoes best for plantar fasciitis include K-Swiss Grancourt II, Nike Zoom Vapor 9.5 Tour, Adidas Barricade 2016, New Balance 1296v2, Asics Gel Kayano 22 and Brooks Glycerin 13. New Balance’s mission is to help athletes achieve their noble goals, and that is what they have been doing for more than a hundred years already. They design their products to fit the wearer. With the 806, New Balance has continued their heritage of creating shoes with superior support and stability. The shoe has been fitted with ROLLBAR technology from New Balance, that prevents excessive movement of the back of the foot. This ensures that you have full control over your strides when you are making those aggressive cuts and strides on the court. The shoe features a full grain leather upper, giving you a classic style and look. The upper has been reinforced at the front with extra protection against toe dragging. The New Balance MC806 Stability also comes with a herringbone, non-marking outsole, crafted with Ndurance technology for providing maximum traction and durability. From the sole to the heel, there is a 10mm drop. This shoe also offers a C-Cap, long wear drag tip; together with a lightning dry lining, to ensure your feet are warm and dry all day long. For cushioning, the shoe has been designed with the legendary Abzorb technology, while the isoprene rubber and Dupoint Engage ensure all day comfort. The New Balance MC806 Stability is also a great tennis shoe for plantar fasciitis. You can choose from navy blue, grey or white. The shoes are true to size and do not require a break in period. The shoe also has sufficient room on the inside, which allows you to use third party insoles of superior quality, if you want to have the best support you possibly can. The 806 has also addressed a majority of the issues and concerns that were to be found in previous editions in the same series. It is one of the most comfortable, stable and supportive shoes for tennis players who truly love the game. The Solution Speed series was introduced a few years back, to give tennis players a lightweight performance shoe. The shoe was comfortable and ultra fast, while providing plenty of stability and support to the foot. The Solution Speed 2 comes with a lower arch and a slightly wider toe box. This shoe works well with wider feet. The slightly wider toe box also promotes increased stability, allowing the player to move with full confidence and at top speed when moving on the court. Apart from the improved stability and fit, the outsole of this shoe provides an outstanding level of durability. The sole lasts longer than most shoes in the market today. The comfortable and soft feel is the first thing you will notice, when you slip on this shoe for the first time. Although it is lightweight, the cushioning is plush and nice. The soft uppers of this shoe flex superbly without creating any pinching on the foot. The arch area has enough pressure to support your foot. This is the perfect tennis shoe for wide feet. The ASICS GEL-Solution Speed 2 is also a versatile shoe. You can wear this shoe for your tennis and then head out with it for your workout the following day. Another strong feature of this shoe is breathability. Even after wearing these shoes for long periods, your feet will not feel like they require some fresh air. The upper ventilation works perfectly and your feet will not feel suffocated or too hot inside. The heat escapes easily, and you can even feel some cool air sweeping inside the shoe, when you are wearing them on cold days. Despite this shoe being lightweight and offering top speed, the durability and resilience offered by the outsole is top class. This shoe lives up to its name. It comes with a lightweight design making it agile and quick. The ASICS GEL-Resolution 6 is a modern classic, designed for all-round performance. It is the sixth version in the long line of ASICs stability tennis shoes. The previous boots in the series have all come with exceptional performance, and this one does not disappoint. An external heel collar and an added midfoot support system, help to increase rigidity. This provides greater resistance to ankle twists that that can occur during aggressive cuts, starts and stops. Great durability and exceptional support are two of the main features of the GEL Resolution. This men’s tennis shoe feels comfortable straight out of the box. The uppers flex with your feet, without giving you too much abrasion or excessive rubbing. When it comes to cushioning, the ASICS GEL-Resolution 6 does not disappoint. They offer the perfect blend of court feel and comfort. Your feet will be protected from the hard court play abuse all day. The tremendous cushioning under the feet protects your feet from shocks, when you land them on the hard court. The upper part of the shoe comes with more mesh than previous versions of this shoe had. The ventilation and breathability are really good because of this. You will probably never want to take these shoes off, not even after winning your game. Heck, I wouldn’t be surprised if you wanted to wear them to bed. In terms of arch support, they impress. They are great tennis shoes for high arches. Lack of arch support can lead to foot pain, especially after playing for long periods. It will keep you standing stable, firmly planted. Almost like a tree, except with more mobility. There is sufficient room in the toe box area for your toes to wiggle around a bit. The deep cut groves that are clearly visible on the outsole, provide a great amount of support and traction, as well as durability. The sole is made with Super High Abrasion Rubber, while an Ortholite Sockliner offers additional cushioning. The T22s are great tennis shoes for plantar fasciitis. They have been a favorite for tennis players, for many years now. It is a comfortable shoe which provides tennis players with wide feet a shoe with more than enough space in the toe box. This shoe is also renowned for its above average cushioning and great stability. If you are looking for a comfortable tennis shoe, then the T22 might very well be what you need. As previously indicated, this shoe has been designed with a generous toe box, which is roomy and wide. The upper is ventilated and flexible for maximum comfort. The shoe looks pretty solid, so you might not think that it could ever be comfortable. However, the moment you put it on your feet, you will likely be pleasantly surprised by their good fit. These shoes have a wide base. This makes them very stable. In terms of stability, they are up there with the best in the market. They are perfect tennis shoes for high arches because they provide such excellent arch support. Another outstanding feature of these shoes is that their heel is slightly more raised than the majority of tennis shoes out there. The T22 is also highly durable. The outsole of this shoe will probably last longer than most tennis shoes you have worn before. Additionally, there is Prince’s RASH toecap. It prevents your toes from having to take the wrap for painful bumps caused by unfortunate missteps. The T22 is a solid shoe that offers very high levels of performance. The shoe is available in nine different colors, offering you a wide range to choose from. Other features of this shoe include the TPU forefoot straps for providing a glove-like fit and support, the PU sockliner for long-lasting cushioning, the ShockEraser midsole inserts for absorbing heavy impact, the PU forefoot insert for dispersing shock under the foot and the TPU shank for improving medial and lateral stability. The Adidas Barricade series continues to be a staple in the world of tennis. The series has evolved continuously to incorporate new technologies and features over time. Adidas likes to continuously improve on their shoe design, in a bid to produce high quality, top performance men’s tennis shoes. The Barricade 2015 is a special edition, featuring Boost cushioning technology around the heel area for added comfort, enhanced energy return, and long-lasting performance. Boost technology is a revolutionary cushioning technology, that emphasizes energy return. A significant portion of the energy you put into it when taking a step, is returned to you for… taking the next step! Boost technology has been around for a while, but the Barricade 2015 is one of the few tennis shoes to use this technology for cushioning. Unmatched stability, durability and support is what the Barricade 2015s will give you. This shoe is ready to wear out of the box. They don’t require a break in period. These shoes offer excellent cushioning thanks to Boost. The uppers are supple and flex naturally with every step you make. The pillow like tongue sitting on the top of the foot, offers an additional level of comfort and cushioning. The uppers hug around the foot, provide a locked-in and secure feeling. The Boost cushioning will make you feel all bouncy and stuff! This shoe is significantly lower than the previous versions, which is a good thing to have on the tennis court. You want to be in touch with the surface you are playing on. The shoe has been designed with a few overlays, that promote breathability and ventilation. In terms of fit, you will certainly like the textured material fitted inside the heel collar. It holds the foot firmly in place, thereby preventing any undesired sliding. The outsole has a sufficient amount of traction. It is also highly durable, with a 6-month outsole guarantee. This shoe lives up to the heritage of the Barricade series, delivering exceptional cushioning, top-notch performance, great stability and long lasting durability. The Bigshot Lite, just like its name suggests, is one of the lightest performance tennis shoe ever. Apart from being really light, it ranks high in terms of comfort and high performance. It features improved cushioning, a more flexible upper, and a moisture wicking lining. All these features ensure that your playing experience, when wearing this shoe, is unmatched. Thanks to its low profile design, your feet remain as close as possible to the court. This gives you great court feel and maximum stability. The 1800 Plantar Support chassis provides loads of stability and cushioning, while the non-slip and non-marking rubber outsole provides great durability and traction, regardless of surface type of the court you are playing on. If you are looking for a high performance shoe that is lightweight and comfortable, then the Bigshot Lite 2.5 should be considered to become your next tennis partner. The upper is a blend of mesh and synthetic leather, with FlowCool technology for breathability, support and lightweight comfort. The DuraWrap and the DragGuard technology combined, form a formidable opponent against toe dragging. This can be really useful if toe dragging just so happens to be a problem for you. The midsole has been designed with the legendary K-EVA that offers support and plush cushioning. The 1800 plantar support chassis provides extra stability, which comes in handy when making lateral movements. The outsole is non-marking, crafted with the Aosta 7.0 rubber compound. It has a herringbone tread pattern for providing excellent traction and durability, so that you can be on your A-game without having to worry about your shoes crapping out on you. Although it costs less than other shoes offering similar features, the Bigshot Lites do not feel flimsy at all. Thanks to these, you will be able to wear a lightweight shoe without having to take out a second mortgage. It is best suited for players who value great traction and maneuverability. This shoe was designed for the player that prefers natural motion and lightweight tennis shoes. The Vapor Court is a redesigned version of Vapor 9 Tour. It offers a comfortable fit and a lightweight feel, while at the same time holding on to its style. This shoe provides optimal foot support and stability. A synthetic leather and split leather upper, offer comfort and style with a supple and flexible fit. A durable outsole provides a wider area of foot movement support. The shoe is low cut, offering you lots of speed and maneuverability that you require to move blazingly fast on the court with confidence. The outsole, made from GDR rubber and a herringbone pattern, provides traction at a high level on different court surfaces. This comfortable and affordable shoe is what your average tennis aficionado needs. The split leather on the upper, offers a supple feel and fit. The synthetic leather has been added for greater durability in higher wear areas. The midsole has been crafted using the human foot’s natural motion principles, to provide the best possible support and foot movement. For lightweight durability, the shoe comes with a foam sole. If you are looking for an affordable tennis shoe, for both training and non-professional events, then the Vapor Court fits the bill. They are very comfortable and light, with a well contoured fit. They provide a rigid foothold, for when you want to move fast to catch that ball. They are great tennis shoes for flat feet, since they do not come with a raised midsole. You can also replace the insoles with other inserts for attaining medium arch support. 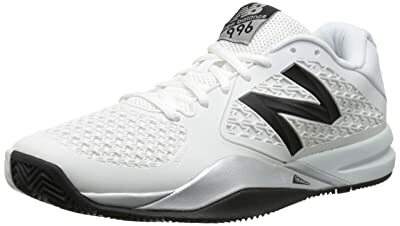 Combining cushioning, durability, and maximum support, the New Balance MC1006V1 offers great court maneuvers for the tennis player who craves vigorous play. They are synthetic and have a mesh upper, which is supportive yet breathable. It also comes with an NDURE toecap for extra resistance against abrasion. The REVlite midsole absorbs shocks and prevents fatigue. The rubber outsole come with an overwrapping forefoot and heel, for those moments of intense play. Your feet will breathe really well when wearing this shoe, thanks to a lot of mesh on the upper. The NB cushioning and arch support is not spongy, but remains firm. They are light and steady. They will allow you to move freely, so you can successfully return those stray balls right to your opponent on the other side of the net. They’ll keep your feet happy, for sure. If you have wide feet, then you will appreciate the roomy nature of these MC10006s. They are so comfortable and well supporting, that you can play every day for a week, without feeling so much as an ounce of pain. These shoes are resilient, comfortable and durable. This shoe is true to size and will fit well right out of the box. You don’t even need to break them in. The sole is perfect for clay courts. 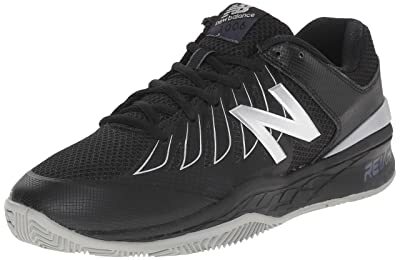 The sleek design of these New Balance shoes, is also a good reason for why they have become so popular with many tennis players. Some people would argue that this shoe is pricey. But hey, if you want high performance and top-notch quality, then you’re going to have to pay the price. See it as a solid, long term investment. It’s not like you’re not getting bang for the buck, or anything like that. For manufacturers… updating shoes is always difficult, since they have to refine the shortcomings of previous models, while retaining the more successful features. 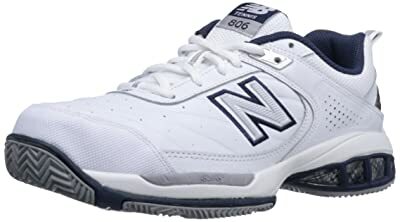 When making this shoe, New Balance took the MC851, which was already successful, improved the stability and the support, while maintaining the lightweight comfort. On top of that, they also gave it a closer to the ground design. This resulted in what you see here… a super-comfortable shoe, that allows tennis players to move around the court with speed, grace and confidence. The low profile of this shoe, is something that any tennis player worth his salt will surely appreciate. This shoe is softer than the previous version, allowing you to play and walk with maximum comfort. The cushioning is great, while at the same time placing you really low to the court. Despite standing low, rest assured that you will still enjoy plenty of cushioning and support. The comfortable fit will prevent any rubbing, so that blisters will not have a shot at screwing up your whole game. Similar to other shoes from New Balance, the MC996 contours to your feet, leaving your feet feeling like they are wearing your favorite pair of warm winter socks, while sipping your victory drink in front of the fireplace. The upper material flexes along with your feet, leaving your toes free to wiggle to their heart’s content. Ventilation is never an issue with this shoe. it is well ventilated and highly breathable. The uppers have been fitted with plenty of mesh, to ensure free air circulation. There is also a rubber cage around the mesh, which gives your feet plenty of room, as well as letting them breathe easily. Ventilation is more than adequate for most playing conditions and surfaces. They come with plenty of arch support, so it is a very suitable choice for tennis players with flat feet. the TPU injected cage, covering the forefoot, leaves your feet locked in, while the NDURE cage prevent your feet from rolling over, whenever you change direction. And in tennis, you’ll be changing direction fairly often. The outsoles hold up nicely, giving you plenty of support and durability. The traction level is just great, keeping your feet stable at all times, even on different types of surfaces. The sole provides a good grip to the court, while never giving you the feeling that your glued to it. You’ll be more than mobile enough. You’ll move with top speed, thanks to these babies, that will make you feel like you are wearing nothing but air. When it comes to tennis shoes, most players prefer light ones. They want something that is responsive, breathable, and fast. The problem is finding a shoe that has the perfect balance between support, comfort and weight. For several years, the Adidas Adizero has reigned supreme when it comes to high-performance, light-weight tennis shoes for men. The company has taken this a step further, with the introduction of Adizero Ubersonic. It has a low-ground profile with minimal essentials to reduce weight and ensure quick movement. The first impression you get with this shoe is that it is ready to wear out of the box. And you’d be right about that. What you will certainly notice right away, is that they are exceptionally light. They have a slightly higher than average arch support. The shoe fits true to size. They will feel like you are wearing a pair of slippers, instead. They fit securely and they have a low profile for responsive movements and quick cuts. The toe box is roomy enough for just about anybody. You will not feel as if your toes are being squeezed at any point. You can play on both clay and hard courts. The level of support these Adizeros give you will feel the same. Even if you are playing in sweltering conditions, the ventilated upper will still provide comfort and superior breathability. The inner bootie and the reinforced upper mesh do not have any noticeable seams. This translates to many hours of comfortable play, without developing any hot spots or pinching. The solid plastic counter gives you extra stability at the rear of the shoe, while also holding the heel firmly in place. The uppers will remain strong for a long time. You are unlikely to see any noticeable wear and tear on it, even after playing for several months. The tread pattern on the sole is a variation of the herringbone pattern. Rest assured that you will have plenty of traction, whether you are playing on a clay court or hard court. 1 Why Wear Tennis Shoes? 2 Why Are Quality Tennis Shoes So Expensive? 3 Where to Buy Top Tennis Shoes for Men Online? 4 Which Tennis Shoes For Men Have The Best Arch Support For Flat Feet? 5 Which Tennis Shoes For Men Are Best For For High Arches? 6 Which Tennis Shoes for Men Have The Most Cushioning? 7 Which Tennis Shoes For Men Are Best For Plantar Fasciitis? My grandson is playing tennis for the first time competitively as a freshman in high school. He is 15 and 6’4″ and wears a size 15. The information you provided was valuable. My only concern was that when I hit the link to the cost of the shoe, I was only taken to Amazon. They never seem to have the shoes you recommend in his size. It was more beneficial for me to go directly to the specific brand’s website. I’m happy to hear the Boot Bomb has been able to provide valuable insights to you. It’s correct that you are taken to Amazon, because Boot Bomb participates in Amazon’s Associates program to generate revenue. If you’d rather visit the brand’s website, you’ll have to navigate there yourself. Hmmm??? Brian you lost some credibility today when i read your reviews. Your number 4 shoe (Prince T22) while i agree it is a good shoe the fact that it is no longer made and can not be bought anywhere with the exception of a few odd sized boxes left over somewhere means you are not up to speed on what is going on in the tennis shoe world. If you want us to trust your reviews you gotta do better dude. Thanks for taking the time to voice your concern. Your timing is impeccable, as I am just about to replace 50 shoe reviews that are no longer available with 50 new shoe reviews, for which the shoes *are* still available. The Prince T22 has been unavailable in the past, but it came back. It’s currently available in quite a few different sizes. For this reason, I’m keeping it on here for the time being. At some point, I’m sure it’ll be unavailable permanently. When that times comes, rest assured that I will update this page with a review of a newer model. I wish you all the best in finding the right pair of tennis shoes for you. what court shoe do recommend for flat feet. I’d go for the Asics GEL-Solution Speed 2. But make sure to replace the stock insoles with Tread Labs, which give superior support and never wear out. My son drags his toe and continues to rip out his shoes. Which one do you recommend that is super heavy duty in this area? Tennis shoes aren’t made for that. They’re made to be light, so you’re not going to find anything ‘heavy duty’ in the tennis shoe department. It almost sounds like he’d need to wear steel toe work boots instead. But if he honestly can’t help but drag his toes, then you’ve got to get whichever tennis shoe has the biggest rubber toe rand. The Gel Solution Speed 2 springs to mind. That’s a fairly specific request you’ve got there. Unfortunately, I don’t know of any tennis shoe that’s better than any other one when it comes to achilles tendon repair recovery. If I were in your shoes, I’d simply go with the shoes that have the highest, best padded collars, for most support around your ankle area. Which men’s tennis shoe is best to buy in 2019 to protect against injuring my big toe and toenail? If you’re experiencing too much pressure on your big toe and its nail, then it sounds like you need non binding shoes. Unfortunately, tennis shoes are never non binding. They need to have a snug fit, so that they’ll stay on your feet while you move about. I don’t know your situation, but there’s a possibility that you can fix this problem by tying your shoes better. I’ve done it wrong for many years myself, until someone pointed out to me a better way to do it. First off, you’ll need shoes that are slightly larger than your feet, so that you’ve got some wiggle room in the front. Then, to make use of said wiggle room, when tying the shoes, place your feet as far back into the shoe as you can. Then tie them firmly enough that your feet can’t move around in there. This keeps some free space in front of the shoe. It should help you protect your big toe nail. I’ve found two shoes for you that get positive feedback from people with narrow feet. The Asics GT-2000 6 and the Asics GT-2000 7. Not officially tennis shoes, but I think you can still use them for tennis.